Have you ever dreamed of experiencing bliss on land as well as underwater? Your dream shall come true in the paradise called ‘Andaman’. If at all there is one place that offers everything to a traveller, it is this land of pristine beauty. Andaman being home to beautiful beaches, enthralling diving spots, indigenous cultures and intriguing history, it is sure to leave you astounded with its unimaginable splendour! On your Andaman holiday, be mind-boggled by visiting these 7 best places. 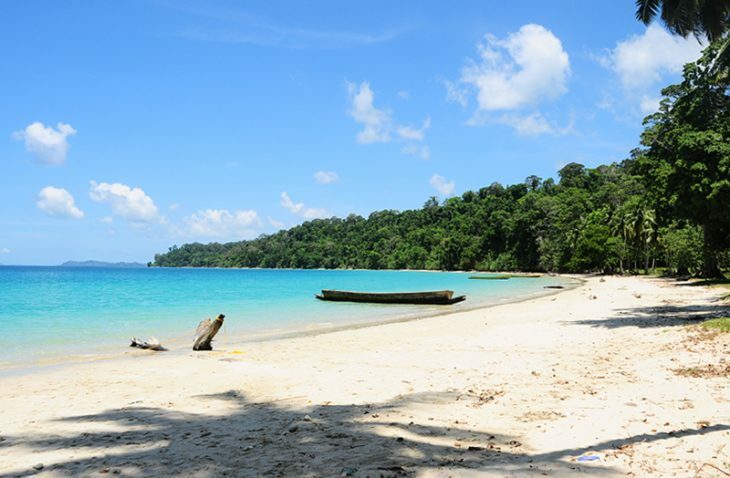 Begin your Andaman escapade by snorkelling at Havelock Island. If you haven’t snorkelled before, this is the best experience you will have! The colourful reefs of Havelock Islands will shimmer through your goggles and this is the moment of ultimate bliss. 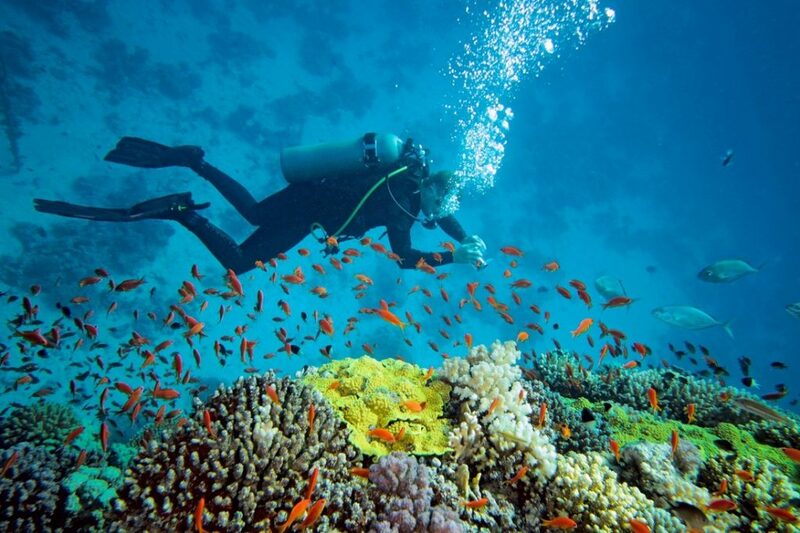 Enjoy the underwater marine life and relish the rarest of corals. You can also get a chance to swim with the star elephant, Rajan. This is the best water activity included in Andaman tourism. Wherever you are, stop everything and imagine tiny lighted stars and galaxies floating under your feet instead of in the blue sky above. It is sure to touch your soul like nothing else ever has. Watch this beauty at the Havelock Island while you row your boat through the waters. This happens due to the presence of phytoplankton in the sea waters. 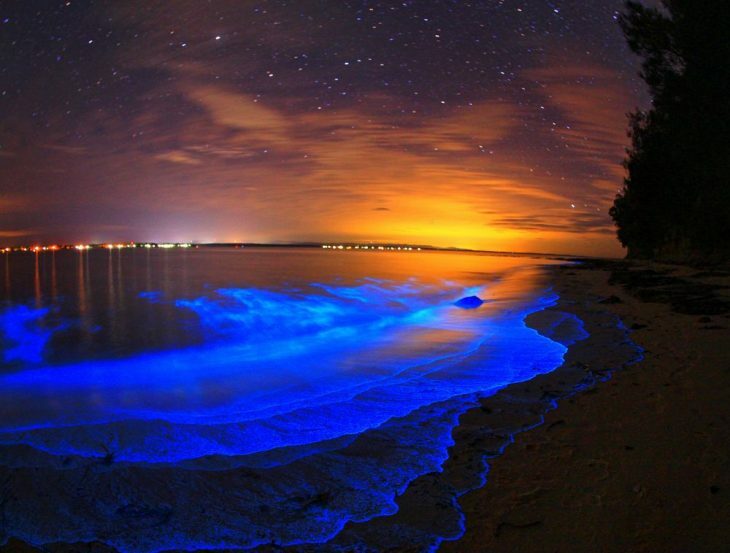 Bioluminescence can be experienced only on no moon nights. This is among the best experiences and places to visit in Andaman. Another incredible water sports activity in Andaman is parasailing. This is an activity that can be enjoyed by non-swimmers as well. 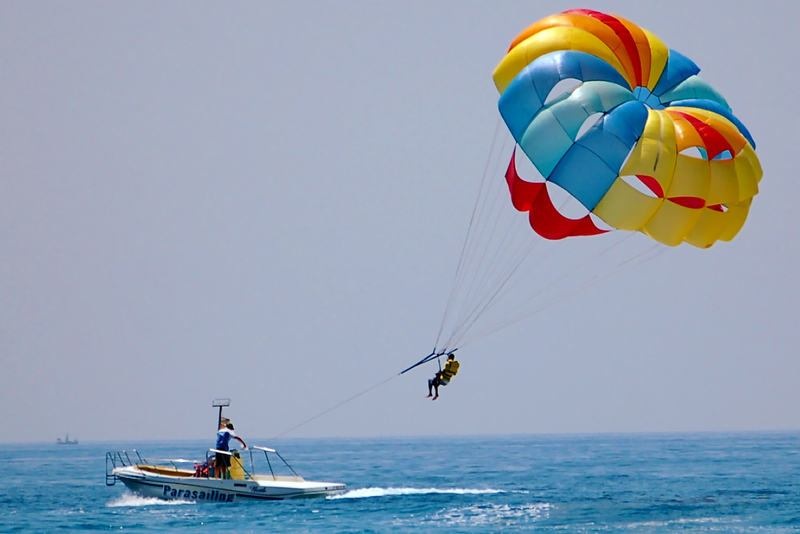 Parasailing is a perfect mixture of water and air borne adventure. You are tied to a motor boat while harnessed in a parachute. Get ready to feel like a soaring kite while the boat speeds off into the sea! Andaman offers all the beach beauty you have been longing for. The Ross & Smith beach is a must visit. It comprises of two wide, beautiful islands of Ross & Smith joining together by a sand bar which is what makes this beach unique. 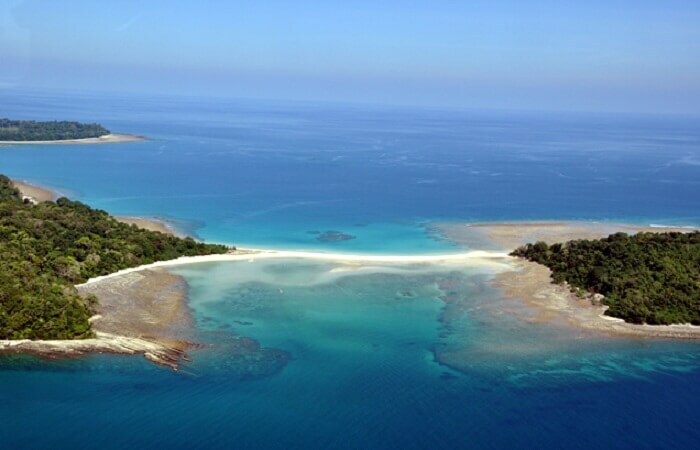 This is among the must visit places in Andaman. Check out best Andaman holiday tour packages to escape into the paradise island. The Long Island beach is one of a kind and not the one to relax. Located on the other side of Long Island, Lalaji Bay Beach is a perfect location for a sea swim. Go out there and enjoy your encounter with the currents of the sea. This is the most different and priceless experience in your Andaman tourism itinerary. 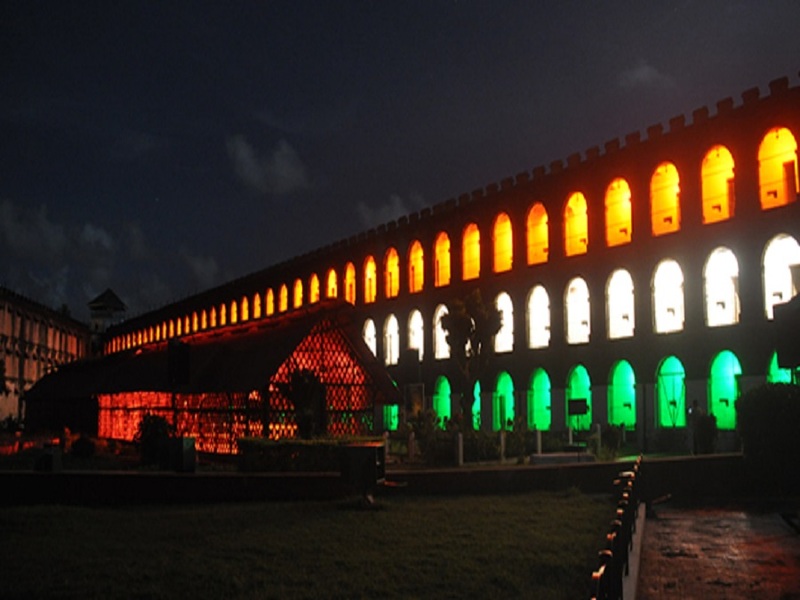 Cellular Jail in Port Blair is among the must visit places in Andaman. The Jail also known as the Kala Panni Jail was used by the British to hold colonial prisoners. The memorial is reminiscent of India’s struggle for freedom. The light and sound show here is the highlight. The show includes a Peepal tree’s narration, voiced by the veteran actor Om Puri, telling the poignant stories of the prisoners tortured to death in the jail. This will be a memorable part of your Andaman Holiday! Located on the Chahtam Island, the saw mill was set up by the British in 1883 and was one of the largest wood processors in Asia. The mill is still operational and is an intriguing insight into the island’s history and economy. While you visit here, look out for the bomb crater left by the Japanese in WW2. These are the 7 best places to visit on your Andaman Holiday, don’t even think of skipping a single one of them! Get ready to be overwhelmed and mesmerised by the beauty of Andaman Islands through Andaman honeymoon packages. Capture as much as you can with your eyes because the camera can’t do justice to the ecstasy you are about to witness at Andaman! Beautiful beaches and tranquil ambiance is everything Andaman is. On your next Andaman holiday, be mind-boggled by visiting these best places.